I imagine when one thinks of a World War II-era warship, they think of sleek battleships and heavy cruisers slicing through waves at 30 knots. A clumsy adaptation of a 30s whale chaser, armed with a single 4-inch gun and a couple dozen depth charges, doesn’t exactly fit one’s description of "superior firepower." The British designed the Flower-class Corvette as a "stopgap" measure to protect Allied convoys crossing the Atlantic. They were slow, poorly armed, and presumably would have "rolled on wet grass." Nonetheless, they participated in the sinking of at 51 enemy submarines. 225 were built, more than any other surface warship class, and they served in ten allied navies. Even the Germans had four of their own, captured when they overran France. The subject of this book is the HMCS Agassiz, a Canadian Flower of the "short forecastle" type, similar to the Compass Rose depicted in Nicholas Monsarrat’s The Cruel Sea. She was laid down in Vancouver in April 1940 and commissioned in January the next year. The Agassiz remained in service until 1945, receiving a major refit in 1943. She was scrapped in 1946. 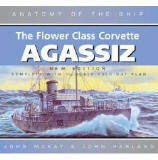 The Flower-Class Corvette Agassiz is the 28th book in the Anatomy of the Ship series. It’s a 160 page hardcover book divided into three main sections: Introduction, Photographs, and Drawings. The reverse side of the book’s jacket doubles as a 1:144 plan of the bow, stern, and profile. 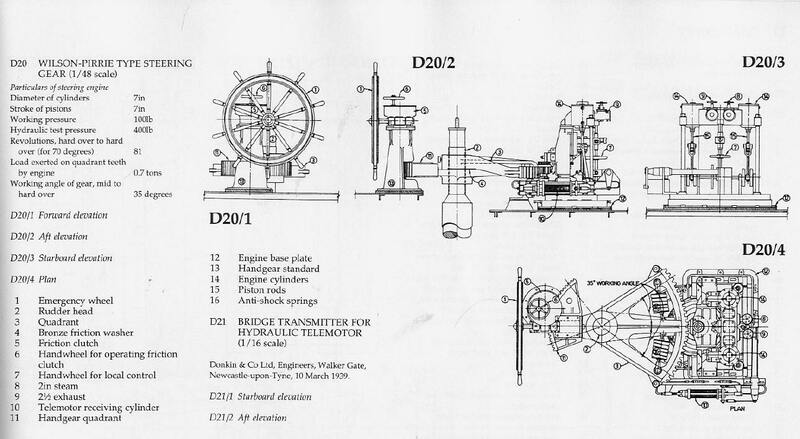 The book begins with an 11-page introduction to the design of the Flower-class, describing, the type’s evolution, machinery, hull structure, and electronics. Following this are a series of 29 black & white photographs, showing overall views of the class and close-ups of the superstructure. The real meat of the book comes next - the drawings. The next 126 pages, contains hundreds of detailed line drawings and schematics of every deck, bulkhead, and fitting on the ship. The back says that there’s "more than 350 drawings," but the actual number is closer to 550. Literally, almost no bolt goes uncovered. The first section covers the ship’s general arrangements. It starts with a series of 1:192 scale plans showing the side, internal profile, and body lines. 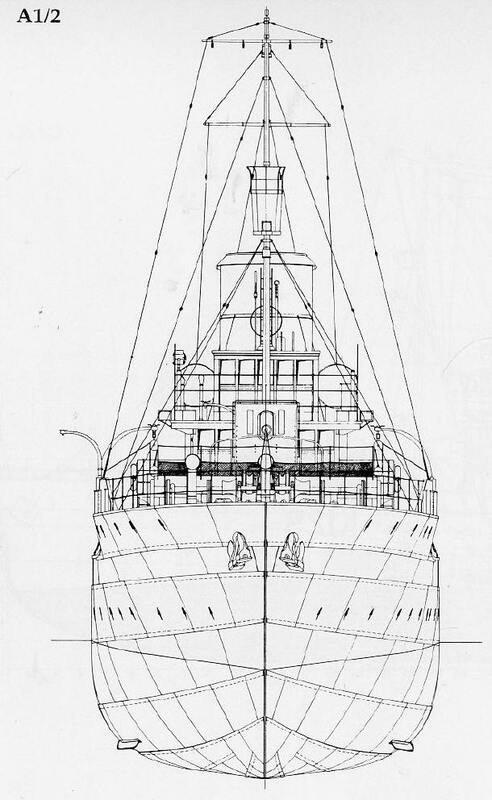 The bow and stern are shown at 1:144, along with plans showing the differences in hull sheer in the Flower variants. Isometric views are up next, along with plan views of all four decks and the compass platforms, and a profile of the engine room casing. Plans of the modifications to Agassiz’s forecastle and upper decks are shown next, along with two isometric views of the entire ship. Chapter B opens with a four page longitudinal section of the entire ship at 1:96 scale. Next up are isometric views of the shell casing, wheel and compass houses, and three of the decks. The third section cuts the Agassiz into 28 1:96 scale transverse sections (that’s "vertical slice" for normal people! ), one every seven feet. Chapter C looks into the ship’s internal construction. 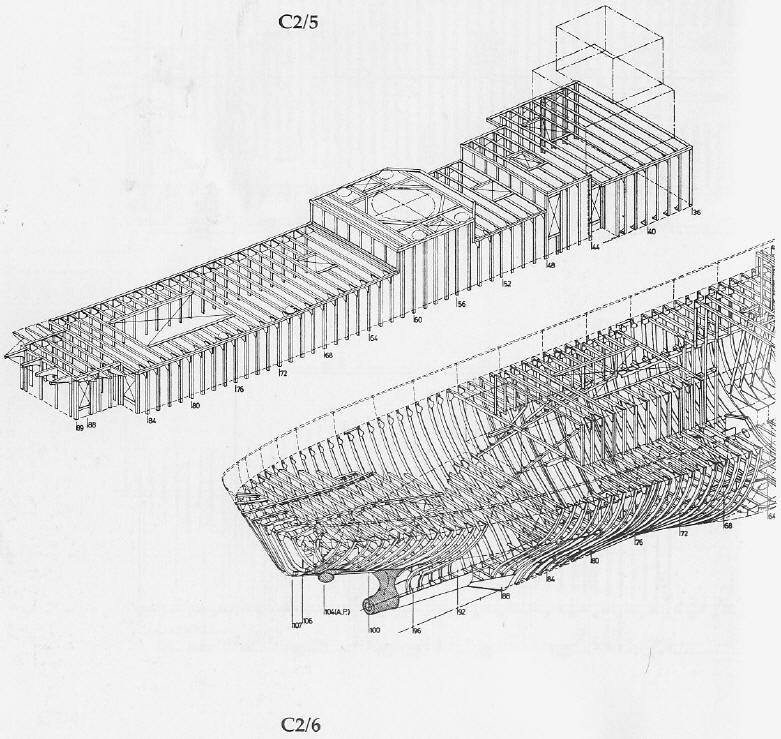 1:192 scale plans of the hull framing and deck beams are shown first, followed by isometric views of the frames, beams, and the keel and floors. Also included are detailed close-ups of the keel and frames, along with the bilge keels, scuppers, washports, stringers, and bulwark stays. Rounding it out are details of the rudder and it’s bearing, the stern framing, and a plan of the ship’s expansion plating. The machinery is covered in Chapter D, which opens with 1:96 scale plans of both levels of the engine and boiler rooms, and elevations of the port and starboard sides. The main engine, boilers, condenser, injection valve and circulating pump, propeller shaft, and steering gear are examined externally and internally in a large number of 1:48 scale plans. Also included is a plan and profile of the ship’s pumping and venting system. Chapter E describes the spars and rigging, and Chapter F covers the ship’s fittings. Fittings have always been a point of contention for modelers, and 38 different fittings are covered here. Some of the fittings detailed are the sounding machine, voice pipes, ammunition lockers, bucket racks, the galley skylight, handrails, and the ship’s whistle. This section also has some good views of the watertight door mechanisms and the anchor windlass. Chapter G looks at the ship’s armament, including the weaponry installed later in the war. This section also details Agassiz’s minesweeping arrangements, along with cross-sections of different types of ammunition. 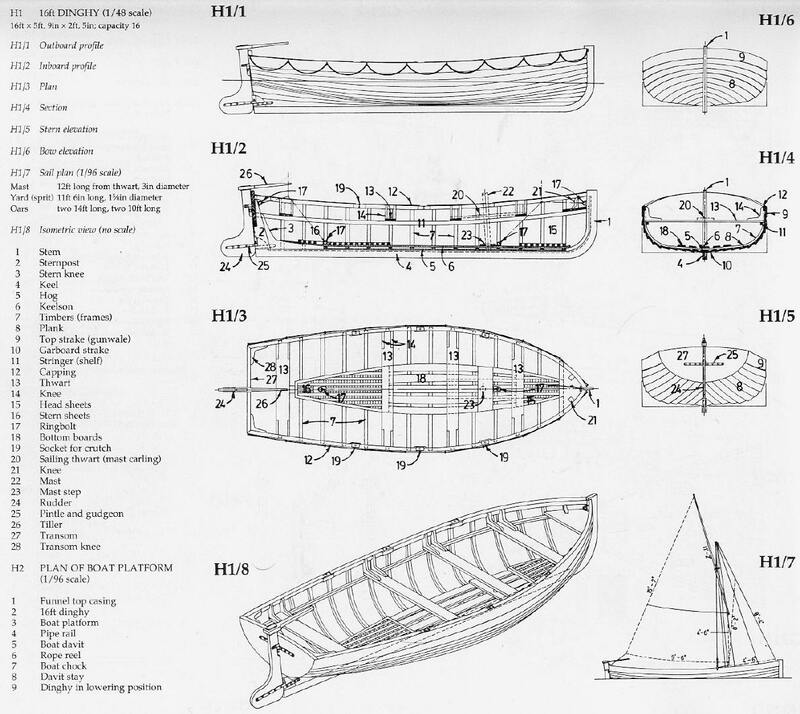 Chapter H details the ship’s 16-foot dinghy, and it’s davit and griping spar. The final chapter has profile views and deck plans of the modified Flower-class and the Castle-Class corvette, a stretched derivative of the Flower. 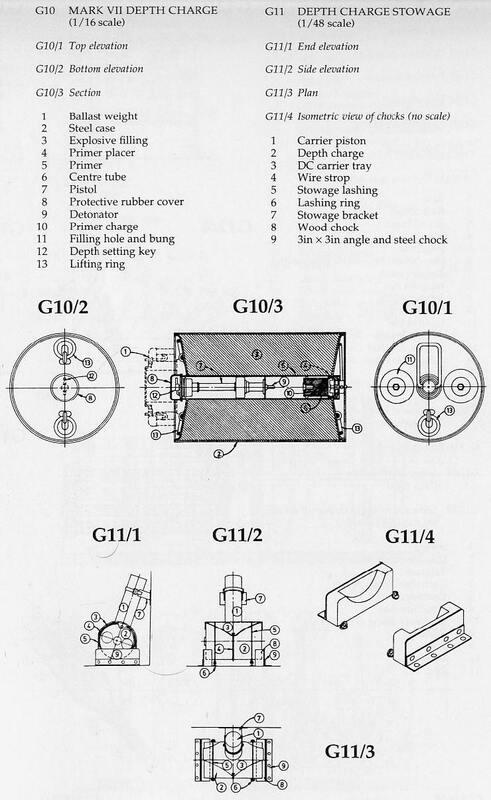 Unfortunately, the machinery details are a sketchy for these two types. The amount of detail presented in these drawings is occasionally unbelievable, and if you don’t believe me, take a look at the scans in this review. The deck plans show every bulkhead and compartment of the ship, right down to the toilets, ladders, and pantry. The four-page cross-section has more than 200 annotations, while the framing plans shows every stringer, girder, and frame, noting the dimension of each beam. The expansion plating plan shows the location of, and the dimensions and thickness of each hull plate. 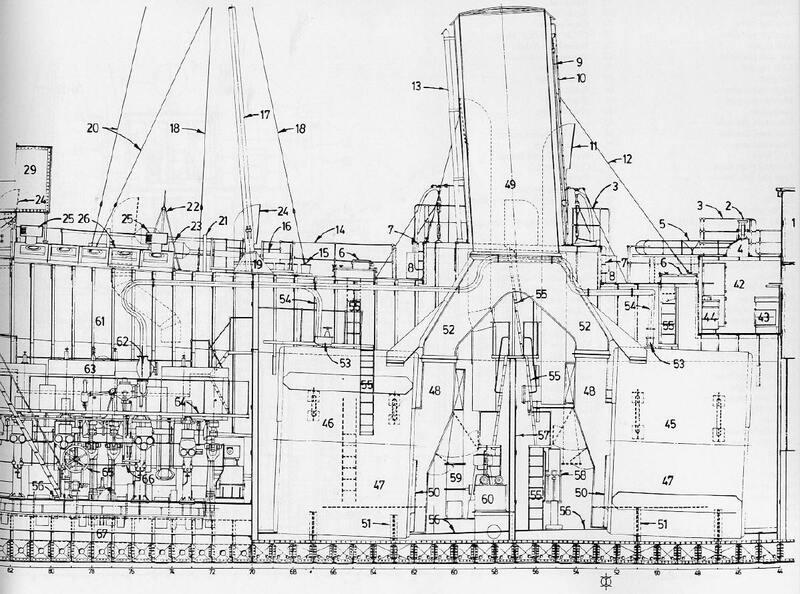 The ship’s engine is shown from six views, showing details as small as stop valves, evaporator coils, and drag links. The illustrations are fantastically well-researched and drawn, and represent perhaps the most detailed study of a single mechanical construct I’ve ever seen. If you’ve never looked at a set of ship plans before, this book might be too much for you. The detail is so overwhelming, I got a headache from squinting for hours! Okay, you won’t find a five-view drawing of the galley stove, but you will learn where they kept the spare depth charge for scuttling the ship. This is my first Anatomy of the Ship book but it won’t be my last. These plans are so well-done that I’m surprised that no one’s built a full-scale working replica of a Flower yet. This is obviously a "niche" title that will only appeal to a small group (or as my Mom would say, "the sort of book that only Daryl knows about!"). It’s an invaluable resource for the modeler and a fascinating title for anyone interested in the technical side of naval history. If the subject grabs you, I highly recommend it.